This is the continuation of the Oil Chronology, Part 1: "A Chronology Leading up to the Soviet Era" which discussed developments in the oil industry in Azerbaijan from the 9th century up to 1920 when the Bolsheviks seized power in Baku. Published in Azerbaijan International, AI 10.2 (Summer 2002). Search at AZER.com. The Oil industry has deep historical roots in Azerbaijan. At the present time, more than half of the national gross output is carried out in industrial production, 70 percent of which is concentrated in Absheron and consists of oil and the oil refining industry. The development of other spheres, especially chemical, electro-technical, machine building and ferrous metallurgy is closely connected with these industries. Since the collapse of the Soviet Union in 1991, the industrial manufacturing spheres, related to oil are experiencing difficulties due to broken relations in the technological spheres. For the first time in the world, thermal processing of drilling chisels appeared in machine building plants of Baku. For the first time in the world, Baku engineer Matvey Kapelyushnikov (1886-1959) worked out and tested a one-stepped turbo drill with reduction gear. The Committee on Oil Prospecting in the Baku and Grozny regions aligned itself with the Moscow Mining Academy, which had been established in 1918. A new oil field called the Bay of Ilych, now known as Bayil Limani (the Port of Bayil) opened in April. Oil Well No. 71, which was built up on island-like woodpiles in the Bay of Ilich, produced marine industrial oil. For the first time in the world, turbo drill invented by Matvey Kapelyushnikov succeeded in drilling a well to a depth of 600 meters at Surakhani, near Baku. Dmitry Golubyatnikov published his work entitled, "Calculation of Oil Deposits on the Absheron Peninsula". For the first time in the world, Baku engineer M.M. Skvortsov constructed a device for the automatic movement of a chisel, which became known as the "automatic driller". Left: Historic signing of the "Contract of the Century" in September 1994 for the development of the Azeri-Chirag-Gunashil offshore oil poject. President Heydar Aliyev at Gulustan Palace, Baku. On July 6, the first Electric Railway in the entire USSR began to operate, connecting Baku's oil fields of Balakhani and Sabunchu. A new technology in drilling was introduced in Baku: electrical aggregates with exact control of the number of rotations came into widespread use. About one third of all Baku oil was being extracted by an invention by V.G. Shukhov-the Airlift Method of Extraction of Fluid Hydrocarbon Raw Material. This method pumped air into an oil layer under such high pressure that, in turn, it would push oil to the surface. Azerbaijan Scientific Research Institute on Oil Processing (named after V.V. Kuybishev was established on October 22. [Since 1959, it has been known as the Institute of Petro-Chemical Processes (named after Y. G. Mammadaliyev)]. The staff was extremely instrumental during the war effort (1941-1945) with their scientific research. Famous inventor, scientist-engineer Vladimir Shukhov (1853-1939) was elected as Honored Member of the Academy of Sciences of the USSR. 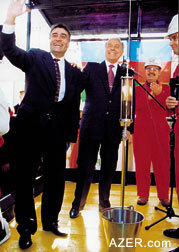 Left: Celebrating "First Oil" in November 1997. Left to right: Natig Aliyev President of SOCAR (State Oil Company of Azerbaijan) with Azerbaijan's President, Heydar Aliyev. Vladimir Shukhov and Matvey Kapelyushnikov invented and constructed tubular cracking ("breaking up"). The process carried out by this equipment became known in the history of oil business as "Soviet cracking" and played a positive role in the development and gaining experience in oil exploitation. Electric logging and devices for the measurement of drilling's curvature was applied for the first time in Baku. Geophysicists from the French firm Schlumberger introduced a method of electric exploration in the oil fields in Surakhani. Azerbaijan Scientific Research and Project Institute of Oil Machine Building was established. This institute played an important role in constructing various kinds of equipment for oil extraction to deal with gushers and mechanized pumps. They also developed equipment for current and major repair of oil wells and equipment for intensification of oil development. A new cracking-plant was built in Baku by Vladimir Shukhov and Matvey Kapelyushnikov. The first Reforming Process in the USSR took place in this plant. Aircraft gasoline produced in this plant had an octane level of 90-95 as well as a low freezing temperature. The first well at a slant (inclined hole) in the USSR was drilled on the shore of bay of Ilych (Bayil Limani) by the rotary method. On Artyom Island, which is now known as Pirallahi Island, the construction of metallic devices on drilled piers for the drilling of sea oil wells began according to a project proposed by N. S. Timopheyev. The Journal called "The Azerbaijan Oil Industry" (former called "Oil Business") began to publish a series of articles by famous engineer Fatulla B. Rustambeyov. For the first time, he stated the theoretical and practical basis of underwater oil deposit exploration and the construction of sea oil wells in the Caspian by analyzing both the experience of Azerbaijanis as well foreigners. Left: One of the greatest catalysts for oil development in Azerbaijan has been the annual Caspian Oil and Gas Exhibition and Conference organized since at the Sports Coliseum since 1994 by Spearhead Exhibitions (now Caspian Events) and directed by Susan Crouch. The central exhibit shown here is for AIOC, the 11-member consortium which is developing the Azeri-Chirag-Gunashli (ACG) project. AIOC's booth was modeled after Atashgah, the Fire Temple at Surakhani, which is also featured in this issue of the magazine. The first multi-stepped direct-drive turbo drill was built by a group of Soviet engineers- Peter Shumilov, Eyyub Taghiyev and others. This year marked the beginning of the industrial application of the multi-stepped turbo drill without a reducer which had been invented by Shumilov, Taghiyev and others. For the first time in the world, an oil well was drilled by the electro drilling construction which was introduced by Ostrovsky, Aleksandrov and others. Gala oil field. For the first time in the world, the first slanted oil well in the world was drilled to a depth of 2,000 meters in Bayil by turbine method. During this year the deepest oil well up to that point in time in the USSR was dug at Hovsani oil field at a depth of 3,200-3,400 meters. Azerbaijan extracted more oil this year-23.5 million tons per year-than at any other time in its history. This amount comprised 71.4 percent of the total oil extracted in the USSR that year and was determinate for the outcome of World War II. A method to synthesize chlorine and thus produce methane and ethane was worked out under Yusif Mammadaliyev (1905-1961). This facilitated the ability to obtain valuable high octane components for aircraft gasoline. A large machine-building plant was constructed in Baku (Kishla) to produce oil and drilling equipment using new technologies. The SSR Academy of Sciences of Azerbaijan was established which consisted of four departments, two of which related to oil: the Department of Geological, Chemical Sciences and Oil, and the Department of Physics, Technical Sciences and Oil. Mir Asadulla Mir Gasimov was elected the Academy's first president on March 31. The first large-block construction of the LAM system (Laboratory of Airborne Methods of the USSR Academy of Sciences) in the oil field region of Gurgani took place. The beginning of the construction of metallic piers according to the project of engineers B. A. Raginsky, N.S. Timofeyev, etc. in the region of Caspian Oil Field Izberg-Izberbash (Daghistan). Later, its analogues and more advanced piers were built in the regions of Kurkan, Darvin, Chilov (Jiloy), Neft Dashlari (Oil Rocks) and Peschaniy (now Gum Adasi). Another First in the World: on August 24 the exploration at Neft Dashlari (Oil Rocks) began in the Caspian sea along the Absheron shelf. Construction of the steel offshore pier began. This was the first time oil had been drilled offshore. After a month, at 1,000 meters, they struck oil. Sometimes, Neft Dashlari is referred to as "The Island of Seven Ships" because during construction of the bridge-head, seven ships were lost at sea. One of these tankers was the famous "Zoroaster", the first tanker in the world which Ludwig Nobel had commissioned to be built in 1877 in Sweden. For the first time in the world, construction of hydro-technical equipment in the open sea was carried out. The work was done by the Scientific Research and Project Institute called "Gipromorneftegaz" . On October 31, by decree of the Soviet Council of Ministers "on the Development of Sea Oil Extraction in the Caspian," the largest oil union-Azmorneft- was established in Baku. For the first time in the world, oil tankers transported oil from the first oil well ever drilled in the sea-Neft Dashlari (Oil Rocks) to Baku. Novo-Baku oil processing plant (NBNZ in Russian) was built and put into operation where the process of catalytic cracking further developed. The development of petro-chemistry became attached to this plant. And the primary base for the petro-chemistry industry was the creation of a new city, a satellite of Baku-Sumgayit ("Komsomolsk on the Caspian") which had been established in 1949. The beginning of the industrial development of Garadagh, the richest oil and gas field. This was the basis of a new industry for the Republic-the gas industry. Oil scientist Eyyub Taghiyev lead a group of specialists to India in search of industrial oil deposits. During 1958-1959 the national oil and gas industry was established there). Taghiyev was appointed for life as the head consultant to the Indian State Administration. Several internal main gas pipelines were built in Azerbaijan. Development of a new major oil and gas field began at Zira. The completion of the construction of the great Transcaucasus pipeline. Azerbaijan began to supply gas to the capitals of neighboring republics. The Lenin Prize is bestowed upon some Azerbaijanis for the complex mastering of oil fields in the sea. The scientists and engineers who received this honor included: V.F. Negreyev, I.P. Guliyev, A.A. Farhadov, R.G. Hajiyeva, A.G. Khanlarova, S.A. Mehmandarov, M.S. Trifel, B.A. Zamanov and M.I. Mammadov. (The Lenin Award was the highest award given in the former USSR. Established in 1925, the prize was awarded every two years on the occasion of Lenin's birthday). First for Azerbaijan: The talented physicist Leo Landau (1908-1968) from Baku was awarded the Nobel Prize in Physics for his research on the peculiarities of helium in very low temperatures. Landau was born in the Balakhani district of Baku. His father David was the Head Engineer of Rothschild's Oil Company, the Caspian Black Sea Society, which had been established in 1883. In April, Eyyub I. Taghiyev and geologist E.A. Bakirov were sent to Brazil to help establish the national oil industry. Their recommendations about the development of oil fields and deep drilling were accepted by the Brazilian specialists and the President of Petro-Braz company. Nikolay Beybakov from Baku was appointed the head of the USSR State Chemistry Committee. The following year, he became head of the State Committee of Oil Processing Industry of the USSR Gosplan (State Plan). Beybakov was recognized as the leading scientist and organizer of development of the largest oil and gas regions of the USSR-Azerbaijan, Volga and Ural (which became known as "Second Baku") as well as Western Siberia ("the Third Baku"). 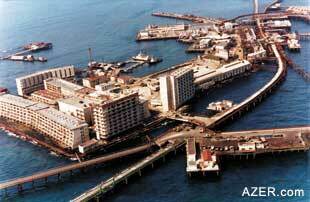 Ministries for Oil Extraction and the Oil Processing Industry were established in Azerbaijan SSR. Famous oil worker Alovsat Garayev (1914-1988) was appointed Chief of the Technical-Economic Management of the Ministry of Oil Extraction Industry of the USSR. From 1965 to 1976, he also served as a member of the Board of Minnefteprom of the USSR (abbreviation is in Russian, in English it means Ministry of Oil Industry). Garayev was the second Azerbaijani after Sabit Orujov to work for Minnefteprom. For the first time in the USSR: The Special Chemical Institute of Additives was established at the Azerbaijan Academy of Sciences on production of poly-functional additives of complex action for motor lubricants produced from Baku oils. First director was Ali Guliyev, an outstanding scientist, academician for which this Institute is now named. In May, a new oil and gas field was opened in Kursangi (Now this project is known as "Kursangi-Karabaghli"). Oil Well No. 26 in the second field of NPU (abbreviation is Russia, in English it means Oil Field Office) Salyanneft used to produce 60 tons of condensate and more than 0.5 mln cubic meters of gas per day from a depth of 2,800 meters. A new technology was utilized in oil processing in Azerbaijan. Equipment for selective rectification of oils by Furfurol, where for the first time the disk capacitors were applied instead of extraction columns. This process greatly improved the quality of motor oil. On January 18, the Fifth Congress of the Scientific Technical Society (NTO in Russian) of the Oil and Gas Industry of the USSR opened in Baku. This organization dates back to Imperial Russian Technical Society (1866-1917) and continued its progressive traditions. Oil engineer Asad Rustambeyov (1911-1982) was appointed Assistant Director of AzNiburneft (abbreviation is in Russian, in English it means, "Azerbaijan Scientific Research Institute of Oil Drilling) of the Central Asia. He played a significant role in the development of the Soviet oil business in Azerbaijan, and the Russian republic of Bashkiriya (now Bashkortostan since 1991. Discovery and the beginning of the development of new oil and gas condensate fields in the Azerbaijan sector of the Caspian: Bahar (1968), Sangachali-Duvanni (1969), Bullamore (1975). Extraction of the oil from the Caspian reached its highest level-12.9 million tons. Valentin Shashin (1916-1977) from Baku was appointed Minister of the Oil Industry of the USSR. Shashin played a great role in the harmonious development of the Western-Siberia oil complex. Upon his initiative, the famous oil worker Tofig Rustambeyov was appointed as Chief Engineer (Deputy Chief) of the Drilling Management of the Ministry of Oil Industry of the USSR. March 28th marked the celebration of the billionth ton of oil to be extracted from Azerbaijan. Sabit Orujov, a Corresponding Member of the Azerbaijan Academy of Sciences was appointed Minister of the Gas Industry of the USSR. As an experienced leader and excellent organizer, he made an invaluable contribution to the development of the Soviet oil and gas industry. To this day, the most distinguished students of Russia State University of Oil and Gas receive the Scholarship awarded in his name-the S.A. Orujov Award. The process of production of platformate from Baku oil was achieved in Sumgayit Organic Semi Products Plant. This process enabled scientists to obtain benzene-the most important chemical raw material. Shamil Jafarov (1929-1990) the famous constructor and organizer of the production of oil industry equipment was appointed as General Director of one of the first scientific-production unions in Azerbaijan-Bakneftemash, which included Bakneftemash and the machine-building plant named after Felix Jerjinski (Surakhani). Azad Mirzajanzade, famous scientist and academician of Azerbaijan SSR Academy of Sciences was awarded the I. M. Gubkin Prize for his work titled, "Application of Non-Newton Systems in Oil Extraction". The award was made by the President of the Scientific Technical Society of the Oil Industry. Five years later, Mirzajanzade was chosen as State Prize winner of the Azerbaijan SSR for his series of work on the "Mechanics of Technological Processes in Oil and Gas Extraction". For the frst time in the world a stationary oil platform was installed in deep water (84 meters). Scientist and chemist Bahadur Zeynalov was appointed as main specialist and Coordinator of the USSR State Committee on Science and Technique on problems related to producing synthetic naphthenic (petroleum) acids. The process that worked out by direct oxidation of naphthenic hydro carbons was patented in the U.S., Great Britain, Democratic Republic of Germany, Romania and Japan. Four new multi-stratum oil fields were opened in the Caspian at a depth of 200 meters: Gunashli (1979), Chirag (1985), Azeri (1988) and Kapaz (1989). These fields have reserves of 700 million tons of oil and 200 billion cubic meters of gas. For the first time in the world: Drilling took place via semi-submersible drilling equipment at a depth of 200 meters. On September 24-27, the head of the Soviet Union Leonid Brezhnev (1906-1982) visited Baku for the third time to award the Lenin Prize. On September 25, he visited the unique operating platform-the drilling installation Shelf-2, which was designed to drill in depths of 6,000 meters. (Brezhnev had previously visited Baku in 1970 and 1978). Scientist and chemist Shamil Vazirov (1942-2001) was chosen as expert for the United Nations in North Korea where he worked in the structure of the International group on organizing a catalytic center. At the same time, he worked at the Polyvinilchloride (PVC) producing process treatment plant in Khamkhin City. Famous oil scientist and geologist Farman Salmanov was appointed as First Deputy Minister of the USSR Ministry of Geology. Salmanov was involved in the development of oil business in the Tumen region and in throughout northern Russia for more than 30 years. Mir Sayid Reza, oil scientist and Editor-in-chief of "Azerbaijan Oil Economy", was appointed as a Member of the Commission of Experts on Oil and Gas Problems of the High Certifying Commission at the Council of Ministers of the USSR, where he continued as a member until the collapse of the Soviet Union in 1991. Kaspmornefteflot builds and commissions a unique diving vessel which became known as the "Academician Tofig Ismayilov". It was equipped with very modern equipment for technical and navigational purposes, and for the system of dynamic positioning. The Ismayilov could operate and submerge to depths of 300 meters. A monograph by Yuri Zaytsev from Baku was published, which was called "Theory and Practice of Gas Lift". As a result, he was honored with the Diploma of the USSR State Committee for People's Education and Enlightenment. At present, Zaytsev directs projects related to the equipment for the gas wells of Orenburggasprom and Astrakhangasprom unions. Yevgeniy Areshev, famous oil worker from Baku, was appointed as Deputy General Director of the state enterprise Zarubejneft of the Ministry of Fuel and Energy of Russia. He supervised one of the main directions of the union's activity-mastering oil and gas resources of the Vietnam shelf. A framework agreement on collaboration in the sphere of joint mastering of oil fields in Azerbaijan and Russia as well as on joint activity in a series of economic spheres which was of mutual interest to both Russia and Azerbaijan was concluded between the Russian Oil Company "LUKoil" and State Oil Company of the Azerbaijan Republic "SOCAR". On May 24-28, the First International Caspian Oil and Gas Exhibition and Conference Incorporating Refining and Petrochemicals took place in Baku. Since then, the event which is organized each year by Spearhead Exhibitions (UK) [now Caspian Events] in partnership with the Azerbaijan Chamber of Commerce and Industry, has become the biggest international annual event in the capital, attracting enormous international and local participation. Azeri, Chirag and deep-water Gunashli (ACG)-International Contract No. 1-was signed by President Heydar Aliyev and the participating international companies on September 20, 1994, ratified in Parliament on December 2, and went into effect on December 12. Because of its potential reserves estimated at 4 billion barrels of oil, this project is often referred to as the "Contract of the Century". The projected investment for this project is $13 billion. 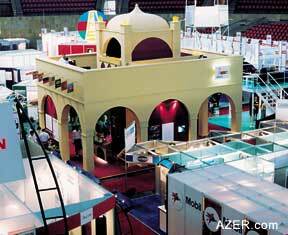 A few months later in 1995, a consortium was organized known as the Azerbaijan International Operating Company (AIOC). Originally AIOC was comprised of 11 major international companies: BP (UK), Amoco (US), LUKoil (Russia), Pennzoil, (now Devon of US), UNOCAL (US), STATOIL (Norway), McDermott (US), Ramco (US), TPAO (Turkey), Delta Nimir (now Amerada Hess of US), and SOCAR (Azerbaijan). Since then Exxon, now ExxonMobil (US); ITOCHU (Japan); and INPEX (Japan) have joined the consortium. McDermott, Ramco and LUKoil have since sold their shares. AIOC's first president was Terry Adams (UK) of British Petroleum (BP), the company which operates the project. On October 9, the routes for two pipelines-both the Northern (via Russia) and Western (via Georgia)-were determined in the AIOC Board of Directors meeting. The length of the Northern route (Baku-Grozny-Tikhoretsk-Novorossiysk) is 1,411 km, of which 200 km cross Azerbaijan's territory. Two pump stations, with a capacity of 80,000 barrels, were to be built along this line in both Azerbaijan and in Russia. The construction of the second pipeline, known as the Western route, between Baku and Batumi (Georgia) was scheduled to begin in March 1997. Its length was 926 km from Sangachal (Azerbaijan) to Supsa (Georgia). In February 1999, this consortium dissolved, opting to abandon their efforts for the development of this prospect, not finding it to be commercially viable. They were the first consortium to do so. Shah Deniz-International Oil Contract No. 3-was signed on June 4, 1996, ratified by Parliament on October 4, and became effective on October 17. This Production Sharing Agreement (PSA) was between the companies BP (UK), Statoil (Norway), LUKAgip (Russia/Italy), Elf Aquitaine (later Total Fina Elf, and now TOTAL, of France), OIEC (now NICO of Iran), TPAO (Turkey) and SOCAR. The value of investment for this contract was $4 billion. Reserves of 500 billion cubic meters of gas and 100 million tons of oil were expected. Dan Ulduzu and Ashrafi-International Contract No. 4-was signed on December 14th, 1996, ratified by Parliament on February 25, 1997, and became effective on March 7. The International companies included Amoco (US), UNOCAL (US), Itochu (Japan), Delta Nimir (Saudi Arabia) and SOCAR (Azerbaijan). The reserves of oil were estimated at 55 million tons for Dan Ulduzu and 90 million tons for Ashrafi. Capital investment was identified as $2 billion. This consortium of companies, known as North Absheron Operating Company (NAOC), closed in 1999. Lankaran-Talysh-Contract No. 5-was signed on January 13, 1997, in Paris in the presence of French President Jacques Chirac and Azerbaijan President Heydar Aliyev. The contract was originally signed by Elf Aquitaine and Total (both of France) and SOCAR (Azerbaijan) and became effective on June 30, 1997. Later on, Deminex (Germany), Oil Industries' Engineering & Construction-OIEC (now NICO of Iran) and Fina (Belgium) joined the project. The effective date of the contract is June 30, 1997. Currently TOTAL (merger of Total, Fina and Elf) is the operator. Projected investment is $2 billion. Yalama / D-222-Contract No. 6-was signed on June 4, 1997 between SOCAR and LUKArco. The contract estimated an investment of $1.5-2 billion on mastering the boundary structure of Yalama with the anticipated deposit of 800 million barrels of oil and 50 billion cubic meters of gas. In 2003, LUKoil used capital from selling its share of the Azeri-Chirag-Gunashli (ACG) project to invest in a larger share in Yalama / D-222 which they operate. The projected investment for this project is $4 billion. Absheron-Contract No. 7-was signed on August 1, 1997, between Chevron and SOCAR. The ceremony took place in the White House, Washington DC, in the presence of Azerbaijan's President Heydar Aliyev and U.S. Vice President Al Gore. The project was ratified by Parliament on November 11 and became effective on December 5. TOTAL was an original partner to this Production Sharing Agreement. The project is operated now by ChevronTexaco. Estimated projected investment is $3.5 billion. Oghuz-Contract No. 8-was signed between Mobil and SOCAR at the White House in Washington, D.C., on August 1, 1997, during President Heydar Aliyev's State Visit. This PSA was ratified by Parliament on November 7, and became effective on December 5. Currently ExxonMobil (operator) and SOCAR are 50 percent partners. Projected investment is $2 billion. Nakhchivan-Contract No. 9-was signed between Exxon and SOCAR at the White House in Washington, D.C., on August 1, 1997, during President Heydar Aliyev's State Visit. This PSA was ratified by Parliament on November 14, and became effective on December 5. Currently ExxonMobil (operator) and SOCAR are 50 percent partners. Projected investment is $2 billion. Kurdashi-Contract No. 10-was signed in Italy on September 26, 1997, when President Heydar Aliyev made a State Visit to Rome. The contract was signed with Agip as operator. Other companies who are participants in the PSA include Mitsui (Japan), TPAO (Turkey) Repsol, and SOCAR (Azerbaijan). Projected investment is $2.5 billion. First Oil Day was celebrated on November 12, 1997. This term refers to the "First Oil" that was extracted from Chirag-1 platform, which is part of the ACG project (Azeri-Chirag-Gunashli). First Oil was the culmination of three years of work by the 11-company AIOC consortium. Actually, oil began flowing on November 7, which coincided with the 48th anniversary of the Oil Rocks field, which was the first offshore project, not only in Azerbaijan, but also in the world. Celebration for the completion of the construction of the oil terminals in Sangachal. Two pipelines-the Northern route via Russia-and the Western route via Georgia-originate at Sangachal. On March 24, the first tanker load of AIOC oil, which consisted of 80,000 tons, was lifted by AIOC's shareholders at Novorossiysk, a Russian port city on the Black Sea. This was oil that AIOC had produced from the Chirag-1 platform on November 7, 1997. Gobustan-Contract No. 11-was signed on June 2, 1998, at the Gulustan Palace in Baku on the occasion of the 1998 Caspian Oil and Gas Exhibition. The PSA was signed by SOCAR, Commonwealth and Union Texas. Ratification took place in October 1998 and the contract became effective November 27. The projected investment is $900 million. Current partners for this onshore project include SOCAR, Commonwealth, China National Oil and Gas Exploration and Development Corporation (CNODC) and Fortunemate. Inam-Contract No. 12-was signed on July 21, 1998 a contract was signed by BP and SOCAR in Great Britain. (Inam had been identified in 1953 using seismic methods). The contract became effective on December 1, 1998. Shell is also a partner in this contract. Projected investment is $3.5 billion. Araz, Alov, and Sharg-Contract No. 13-was signed on July 21, 1998, at 10 Downing Street in London in the presence of British Prime Minister Tony Blair and Azerbaijan's President Heydar Aliyev, who was on a four-day official visit to the UK. The contract was signed between BP, Statoil and SOCAR. Projected investment is $10 billion. Current partners are BP as operator, SOCAR, ExxonMobil, Statoil, TPAO (Turkish Petroleum Company), and Encana. Muradkhanli-Contract No. 14-was signed on July 21, 1998 at 10 Downing Street in London in the presence of British Prime Minister Tony Blair and Azerbaijan President Heydar Aliyev who was in the UK on an official visit. Ramco was the operator of this onshore project. The Consortium was dissolved in 2001. On October 5-8, the Third International Oil and Chemistry Conference was held dedicated to the memory of the academicians Murtuza Naghiyev and Vahab Aliyev. Presentations were given by representatives from the U.S., Russia, Turkey, Iran, Ukraine, Bashkortostan and Kazakhstan. In December, construction on the 827 km Western pipeline route between Baku-Supsa was begun. A year later, it was averaging 105,000 barrels per day-the equivalent of 5 million tons a year. Professor Nil Khayreddinov (who was born in Baku), published"Geotechnical Pecularities of the Development of Oil Fields in Southwest Bashkortostan" (South Ural Mountains, Russia). In this book, he summarized the results of investigations in the sphere of forecasting the methods of increasing of oil recovery for major oil and gas extracting regions of Russia. Kursangi-Karabaghli-Contract No. 15-was signed on December 15, 1998, between Frontera Resources Corporation and SOCAR. The agreement heralds one of the first onshore rehabilitation, development and exploration projects in Azerbaijan to be conducted under a production-sharing agreement. Currently the fields are producing a combined total of approximately 4,200 barrels of oil daily. The Kursangi-Garabaghli Block is located 100 km southwest of Baku. Current partners in Salyan Oil consortium include, SOCAR, China National Oil Development Company (CNODC) and Fortunemate. After being ratified by Parliament, the project became effective April 22, 1999. Projected investment is $1 billion. Atashgah-Contract No. 16-was signed on December 25, 1998, between four Japanese companies SOCAR (State Oil Company of Azerbaijan Republic) for development of three offshore oil prospects (Yanan Tava, Atashgah and Mughan Daniz) in the Azerbaijan sector of the Caspian Sea. The consortium includes Japan Petroleum Exploration Corp.
(JAPEX), Teikoku, Indonesia Petroleum Ltd. (INPEX) and Itochu and SOCAR. Projected investment is $2.5 billion. Zafar-Mashal-Contract No. 17-was signed in Washington, D.C. on April 27, 1999, along with two other contracts during President Aliyev's official visit to the U.S. The contract was signed by ExxonMobil and SOCAR. Projected Investment is $3 billion. Partners currently include SOCAR, ExxonMobil and ConocoPhillips. The project became effective May 8, 2000. Lerik-Contract No. 18-was signed in Washington, D.C. on April 27, 1999, along with two other contracts during President Aliyev's official visit to the U.S. The current operator is ExxonMobil. Projected investment is $3 billion. Padar-Contract No. 19-was signed in Washington, D.C. on April 27, 1999, along with two other contracts during President Aliyev's official visit to the U.S. The original contract was signed between Moncrief and SOCAR. The project is currently operated by Kur Operating Company and the partners are Nations Energy and SOCAR. Projected investment is $2 billion. On September 21-24, the Fifth International Baku Congress, "Energy, Ecology, Economy" was held. More than 220 reports were made in four sections: "Ecological Problems of the Caspian", "Ecological Problems Related to the Northern and Western Pipelines", "Energy Conservation, Change of Climate, Restored Sources of Energy" and "Recommendations on Legislative and Normative Documents" (Previous symposiums and conferences had been held in Baku in 1991, 1993, 1995 and 1997). In November, at the Summit meeting of OSCE (Organization on the Security and Cooperation of Europe) in Istanbul, the heads of states from Azerbaijan, Georgia and Turkey signed an interstate agreement to support the main export pipeline between Baku-Tbilisi-Ceyhan (pronounced Jeyhan). This pipeline would become known as the BTC Pipeline. On December 22, the tanker Birch loaded with 1 million barrels of Azerbaijan's first profit oil was shipped by TotalFina from Supsa to Lavera (France). Kalamaddin-Mishovdagh-Contract No. 20-was signed on September 12, 2000 and became effective November 22. The PSA (Production Sharing Agreement) was initially signed between Moncrief and SOCAR. Currently the project is being operated by Karasu Operating Company and the partners are Nations Energy and SOCAR. Projected investment is $1 billion. Zigh-Hovsan-Contract No. 21-was signed on January 9, 2001 on the occasion of the first official State Visit of President Vladimir Putin to Azerbaijan. The PSA was signed between LUKoil and SOCAR. Projected investment is $250 million. Beginning in March, Dubai Oil Company of Middle East Petrol began operating the oil terminal in Dubandi on the Absheron Peninsula. This terminal greatly expanded transit export. Dubandi was originally built in 1970 and is located 47 km. north of Baku. On September 18, the Construction Phase of the Baku-Tbilisi-Ceyhan (BTC) oil project was officially begun. The ceremony took place at the Sangachal Terminal Expansion area. Presidents from the three countries through which the pipeline will cross were present: President Shevardnadze (Georgia), and President Ahmet Necdet Sezer (Turkey) joined Azerbaijan's President Heydar Aliyev to mark the occasion. Oil is expected to start flowing early 2005. In September, Isgandar Jafarov, Doctor of Geological-Mineralogical Sciences and Academician of Russian Academy of Natural Sciences, was appointed Senior Vice-President of Siberian-Ural Oil, Gas and Chemical Company. Previously, he held the position of Director of Geology and Development Department of the Tumen Oil Company. Ion Iliesku, President of Romania paid an official two-day visit to Baku on October 29. He expressed Romania's willingness to transport Azerbaijan oil and gas to Europe, as well as to acquire Caspian energy resources. The total amount of oil extracted from Azerbaijan's oil fields consisted of 12,686 million tons; 7,444 million tons of this was extracted by SOCAR and 5,242 million tons by the Azeri-Chirag-Gunashli (ACG) consortium. In February, Stage 1 Development of the Shah Deniz gas and condensate offshore field was signed. This marked the beginning of the new gas pipeline, South Caucasus Pipeline (SCP) which will be constructed from Azerbaijan to the Black Sea in Georgia. The new pipeline will be 690 km long (442 km in Azerbaijan and 248 km in Georgia) and will use the same corridor for construction as the Baku-Tbilisi-Ceyhan oil pipeline which extends on to Turkey. The funding shareholders of the South Caucasus Pipeline are the same as for the Shah Deniz PSA. They include BP as operator, Statoil, TOTAL, NICO, LUKAgip, TPAO and SOCAR. 1. Azerbaijan International, Sherman Oaks, CA (US), 1993-2003. Search at AZER.com. 2. Azerbaijan Oil Industry (magazine). Baku, 1995-2002. 3. Oil Industry (magazine). Moscow, 1995-2002. 4. Territory of Neftegas (magazine). Moscow, 2001-2002. 1. Balayev, S. G., Oil of the Country of Eternal Fire. Baku: Azernashir Publishing House, 1969. 2. Lisichkin, S.M., Outstanding People of Native Oil Science and Technique. Moscow: Nedra Publishing House, 1967. 3. Academy of Sciences of Azerbaijan SSR. Edited by H.B. Abdullayev. Baku: Elm Publishing House,1976. 1. Mir-Babayev, M.F., "Absheron Oil: The Development of Oil Business in Azerbaijan" in Chemistry and Technology of Fuels and Oils, Moscow, No. 3 (1993), pp. 36-37. 2. Mir-Babayev, M.F., "Azerbaijan's Oil History: A Chronology Leading Up to the Soviet Era-Azerbaijan International Magazine, Sherman Oaks, CA (US) AI 10.2 (Summer 2002), pp. 34-41. Search at AZER.com. Mir-Yusif Mir-Babayev has a doctorate in Chemical Sciences and is a professor at the Azerbaijan Technical University. His special interest is the early history of Azerbaijan's oil. For Part 1 of this series, see "Azerbaijan's Oil History, A Chronology Leading up to the Soviet Era" in AI 10.2 (Summer 2002). Search at AZER.com. Contact M.F. Mir-Babayev: mirbabam@bp.com or mir_yusif@yahoo.com.